The juvenile loggerhead turtle was found by a father and daughter on Sunday. Experts believe that the turtle got lost after being carried by the Gulf Stream hundreds of miles away from its native warm waters near the west coast of Ireland. According to a spokeswoman for Exploris Aquarium in Portaferry, the aquarium’s seal team made the five-hour trek up to Donegal on Monday after receiving the rare reports regarding a stranded turtle. The turtle’s condition is being described as “critical,” and it is receiving intensive care at the sanctuary. When the team first found the turtle, it’s body temperature was at an extremely low 11°C. But, staff have managed to raise its temperature to 17°C. Loggerhead turtles can live to be 50 years of age, but this turtle is believed to be only a year and a half old. 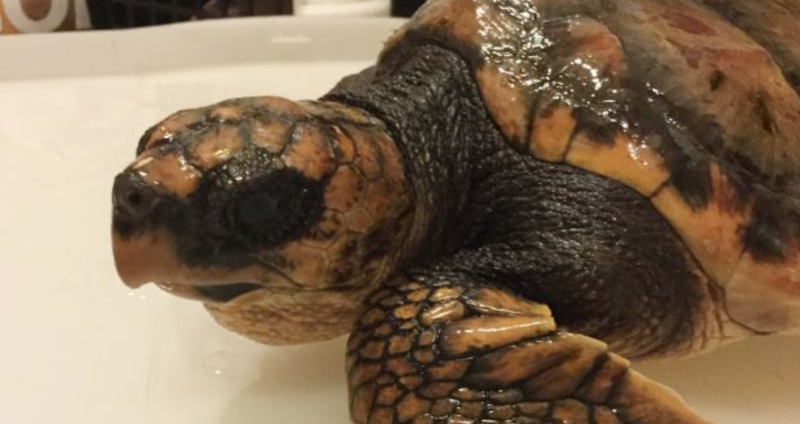 Peter Williams, the aquarium curator, has issued an appeal to the public to keep an eye out for any other loggerhead turtles on the coasts of Ireland. He asks for anyone with information on the matter to contact the Exploris Aquarium at (028 4272 8062).